If you're new to 3D and are unfamiliar with UVs, Autodesk's Knowledge Network explains, “UVs (pronounced U-VEEZ) are two-dimensional texture coordinates that reside with the vertex component information for polygonal and subdivision surface meshes.” They remind me of when I was a kid and my mom would sew and lay out the patterns on the fabric and pin them down. They do have a feature called Cut & Sew, so I guess that comparison is accurate. Below is an example from the Autodesk page on UVs, so you can see what I mean. The Autodesk Knowledge Network covers the overhauled UV editor in detail, including the UV Editor menu and View Bar, the UV Toolkit, Cut & Sew, Unfold, and more. This is a nice explanation from Tiedie of what UVs are all about. He does talk pretty fast but it's explained pretty clearly. The UV editor changed a lot in Maya 2017 release 3. Stephen Roselle at My Oh Maya explains the overhaul of the UV tools in Maya 2018. Stephen Roselle gives a video overview of some improvements in the latest Maya release. Malcolm Andrieshyn is the Lead Environment Artist for The Coalition, and in this tutorial, he explains how to use the Cut & Sew workflow in Maya 2018 to unwrap UVs. He has a script in the description on the YouTube page for an advanced workflow that you may want to check out too. 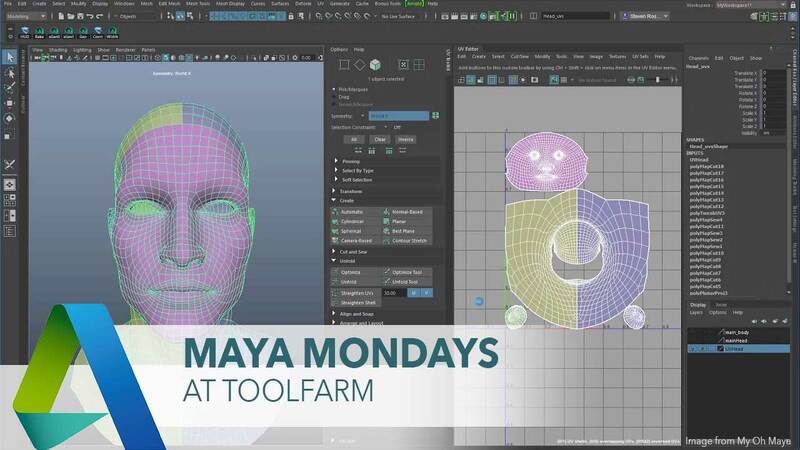 The Maya Learning Channel has a few tutorials on UV Mapping Game Assets. Here is a playlist of 3 videos. The assets can be downloaded here.